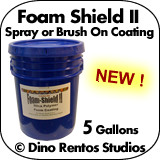 5 Gallon Foam Shield II - Foam Coating - Dino Rentos Studios, INC.
Dino Rentos Studios Foam Shield is a protective yet flexible hard foam coat for foam sculptures, props and architectural foam shapes. 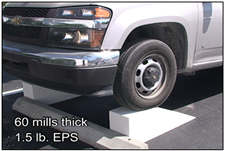 Foam Shield is manufactured using acrylic latex resins comprised of water-based polymers and other unique compounds. This is a simple premixed, one componet coating; ready to use. It can be sanded. This coating is like a batter that you brush on your foam sculpture and gives it the hard outer coat for indoor or outdoor use. Cleans up with water. This carefully crafted formula drastically reduces the emission of Volatile Organic Compounds (V.O.C. 's) making it safe for applicators and the environment. Call for quantity discount on product and shipping.